We have homeschooled a long time and one question I get asked a lot is, "What about high school?" It is easier to homeschool higher grades now more than ever. Most homeschool parents did not receive a classical education, but would love to provide a good one for their children. That is when you get a master teacher to teach the class for you. Roman Roads Media does just that. We have used Visual Latin and Dave Raymond's American History before, so when we were offered the chance to review Old Western Culture: The Greeks we couldn't pass that up. Old Western Culture: The Greeks Year 1 is recommended for students in 8-12 grade. It is divided into 4 units: The Epics, Drama and Lyric, The Histories, and The Philosophers. The DVD/online course covers history, theology, philosophy, poetry, and art by using great works that influenced the Western world. This is a full year curriculum taught by master teacher Wes Callihan. Each unit contains 12 video lessons that last about 30 minutes, completing the unit in 9 weeks. A student will spend from one to three hours a day completing the reading, watching the lecture, and answering the questions. Once completed the student will have earned one credit in literature and one credit in social studies. There are 16 DVD's, PDF Workbooks, Teacher's Edition, Exams with answers, a course guide for each unit, a suggested schedule, and additional PDF texts. The DVD full curriculum is available for $224 or you can purchase the self-paced online streaming for $199. The PDF files come with the curriculum or you may purchase actual books for an additional price. The required reading materials can be acquired however you like. Either by purchasing the books, finding them for your mobile device, or e-books to use on the computer. The Greeks: The Epics is the first unit and covers The Iliad and the Odyssey by Homer. Wes Callihan shows us the beauty of Homer's poems as he covers the plot, poetic devices, background, philosophy, and history in a story telling fashion. While we study these classics we get to see over 100 exhibits of historical artifacts, and famous renditions of Homeric scenes in classical painting. 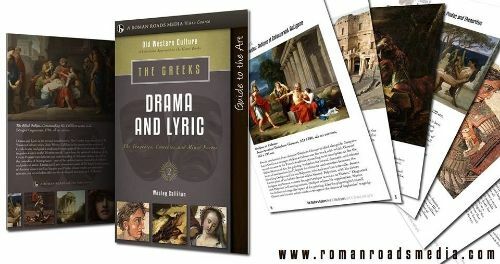 The Greeks: Drama and Lyrics is part 2 of the series that goes back to the beginning of drama and some early comedies and tragedies known to the Western world. It covers three tragedians from the Ancient Greek world, Sophocles, Aeschylus, and Euripides and Aristophanes, a Greek comedy writer. Greek lyric poetry passages by Pindar, Sappho, and Quints of Smyrna are also introduced. There are a lot of Greek poets and playwrights covered in this unit, so Roman Roads has published a book that contains 7 of the 10 authors. This e-book is included with the purchase and makes it easier on you. The Greeks: The Histories is the third part of The Greeks. In this unit Wes introduces us to three influential early historians. We learn about Herodotus, "The Father of History", Thucydides' History of the Peloponnesian War, and lastly we read Xenophon's Anabasis, the account of ten thousand Greek soldiers on a journey through enemy territory. The Greeks: The Philosophers is the last unit of this course. We learn about the works of Plato and Aristotle. It includes Plato's Apology, Crito, Phaedo, Phaedrus, and Republic. Aristotle's Metaphysics, Ethics, and Poetics are also included. Wes explains how the Christian church and society have been influenced, both good and bad, by the ideas of these men. We received the The Epics, Drama and Lyric, and The Philosophers as on-line streaming and The Histories on DVD. We also received the download PDF files of the student workbooks and answers, exams and answers, and Guide to the Art for all four units. The Histories Guide to the Art book came with our DVD. The lectures in The Greeks DVDs are given by master teacher, Wesley Callihan. He has a bachelor degree in history, has taught college level courses, has written curriculum for several Christian Schools, has had books published, is a speaker for classical Christian educators, teaches Latin in the summer, and is an ongoing contributor to the classical Christian education movement. I have been using this primarily with Amber (age 13), but Delaney (age 12), Alaina (age 9), and myself have been involved in at least some aspect. Alaina just happens to be in the same room with us while we are watching the DVD, but that is about all she does. At least she is getting an introduction to The Greeks and to sitting through lectures. I originally wanted to start with unit 1: The Epics, but when our DVD (The Histories) arrived the girls thought it was nicer to sit on the couch and watch the lectures from the TV instead of watching on the laptop. We started out following the schedule but with it being summer time it didn't go as planned. I do love having the schedule to keep everything in order, and once school officially starts at our house we will follow it exactly. All three of my girls and I watched the lecture together. Alaina usually played quietly in the same room, but the rest of us just watched. I was hoping Amber and Delaney would work through this together, but Delaney wasn't really into it. She is a little young for this so she just watched the lectures. I had Amber complete the reading assignments and the workbook pages. A lot of the questions we went over together, so we could discuss the answers. Each lesson starts with a brief review, then after the new lecture the reading assignment is given and there are questions to answer in the student workbook. We all enjoyed going over the art that is included in the Guide to the Art. Amber and I are both learning a lot from this course. I think it suits high school level or even adults can learn and appreciate this course. It is taught from a biblical perspective which I really appreciate. We are looking forward to continuing on with the rest of the course. The online streaming worked really well & really there is no difference between that and the DVD, but my girls like watching the lectures on the TV instead of on the computer. The Old Western Culture: A Christian Approach to the Great Books is a four-year course recommended for grade 9-12. Each year would give the student a credit in literature and social studies. Roman Roads Media wants to provide the teacher. The courses use a series of lectures to inspire the student and to help them become college ready. 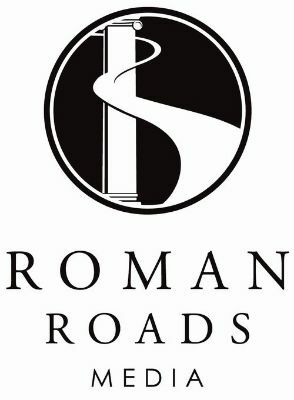 Crew members received several products from Roman Roads and you can read those reviews by clicking on the banner below.